Barclays Center, NYC & Company and WWE have agreed to a multi-year deal to bring SummerSlam, Monday Night Raw® and NXT®back to Barclays Center in Brooklyn in August 2016 and August 2017. This announcement comes on the heels of an extraordinary SummerSlam Week last month which saw WWE sell out Barclays Center for an unprecedented three consecutive nights with NXT Takeover™: Brooklyn, SummerSlam and Monday Night Raw. This year’s SummerSlam Week combined the best of sports and entertainment while leaving a lasting impact on the host community. Jon Stewart served as host of SummerSlam in his first public appearance since retiring as host of The Daily Show and Arrow star Stephen Amell teamed up with WWE Superstar Neville™ to take on WWE Superstars Stardust® and King Barrett®. 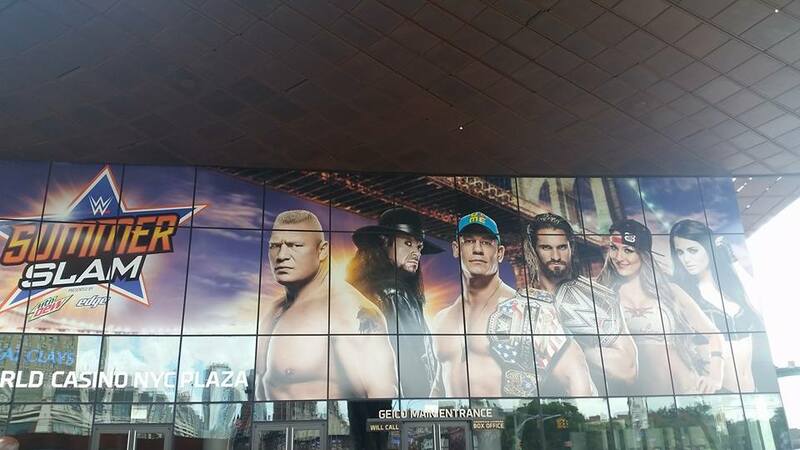 ESPN’s coverage of SummerSlam included exclusive interviews with WWE Superstar Brock Lesnar®, and ESPN’s SportsCenter broadcast live from SummerSlam throughout the day. In addition, WWE joined forces with Charity Buzz to raise more than $200,000 for Answer The Call, the New York Police and Fire Widows’ and Children’s Benefit Fund while hosting 10 community outreach events, including the record-setting 500th wish granted by WWE Superstar John Cena® for Make A Wish. SummerSlam, which is broadcast around the world live on WWE Network, features the biggest stars of WWE alongside other celebrities, entertainers and athletes. SummerSlam Week in Brooklyn will feature a series of activities including fan events, autograph signings, WWE’s Be a STAR® anti-bullying rallies, hospital visits and other community outreach programs designed to leave a lasting impact throughout the region. Ticket and suite information for SummerSlam in 2016 will be announced in the near future.